I get it washing your face can be a hassle, but trust me it is totally worth it. Sleeping with makeup brings no good news. The makeup mixes with oil, sweat and dirt, clogs your pores which allows acne causing bacteria to spread and cause blemishes to erupt. Sleeping in your makeup also causes dehydration to your skin leaving it dry and cracked. But sometimes, especially after a long day at work, you just want to get it off without having to jump in the shower or bend over at a sink at that very moment. But in the evening before bed, gather some energy and wash up my face with good cleansers. There are 3 simple, easy ways to removing makeup, and still have your face hydrated. 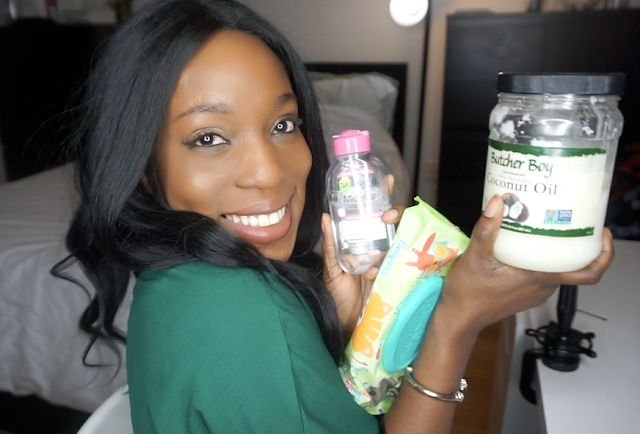 Micellar Water, coconut oil and baby wipes. These 3 ways are gentle on the skin and not only remove makeup but also refreshes the skin. They lift away dirts, oil and makeup without over drying. Do you agree with me? or do you have other means of removing makeup for busy women. Let me know in the comment box below. Three Facial Serums I Can't Live Without. Fun Times in Washington, DC.